This listing is for a small rosewood mala for meditation. There are 108 rosewood beads on the string and each bead measures 4.5mm approximately and guru bead measures 7mm and the circumference of the mala is 20 inches long. This mala can be wrapped around your wrist 2 to 3 times. This mala is strung in Kathmandu Nepal by Tibetan artisans. Prayer Beads mala are usually used for meditation, counting mantras and prostration and etc. Malas are worn on left wrist while not in use. This listing is for a small rosewood mala for meditation. 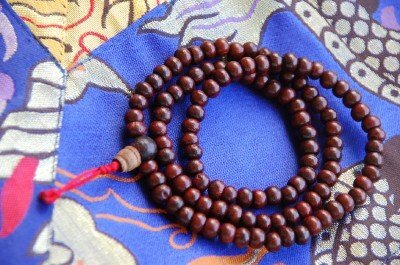 There are 108 rosewood beads on the string and each bead measures 4.5mm approximately and guru bead measures 7mm and the circumference of the mala is 20 inches long. This mala can be wrapped around your wrist 2 to 3 times. This mala is strung in Kathmandu Nepal by Tibetan artisans. Prayer Beads mala are usually used for meditation, counting mantras and prostration and etc.
. Malas are worn on left wrist while not in use. If you have any questions about this product by Hands Of Tibet, contact us by completing and submitting the form below. If you are looking for a specif part number, please include it with your message.